Despite much talk of an expected major retrenchment in consumer spending, the savings rate in America continues to hover in the low single digit range and consumer spending still accounts for over seventy percent of GDP. The fate of the overall economy may hinge on the degree to which Americans curb spending in the coming years in order to repair balance sheets that have been damaged by the housing crash and declines in the value of investment accounts. In such an environment, investing in retailers requires a careful consideration of the presence of a moat as well as secular trends that may provide the business with a tailwind. 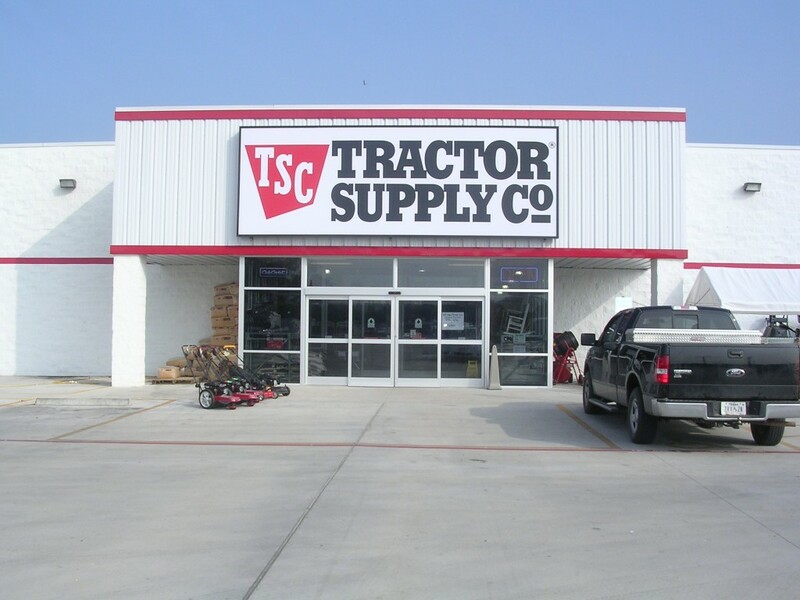 Tractor Supply Company is a specialty retailer with a well defined niche market catering to the lifestyle needs of recreational farmers and ranchers. The company offers an array of products required in the daily life of those who live in rural communities. While discretionary durable goods are a significant portion of revenues, the company also offers non-discretionary consumable products that attract recurring business. Tractor Supply defines its customer base as those who enjoy the “Out Here” lifestyle. The company’s marketing message emphasizes a pioneering spirit coupled with the importance of rural communities and attempts to position itself as the supplier of choice within such communities. With 948 stores in 44 states averaging 15,500 to 18,500 square feet, Tractor Supply’s retail format is much smaller and more specialized than retailers such as Home Depot and Lowe’s which cater to a more suburban clientele. The company has been growing rapidly even in the midst of recession and operating with minimal financial leverage. As of Friday, July 9, Tractor Supply had a market capitalization of $2.39 billion at a share price of $65.74. In recent years, Tractor Supply’s product mix has been shifting toward consumable products that drive recurring business. While the company reports results in a single segment, product category information is provided in the financial reports. 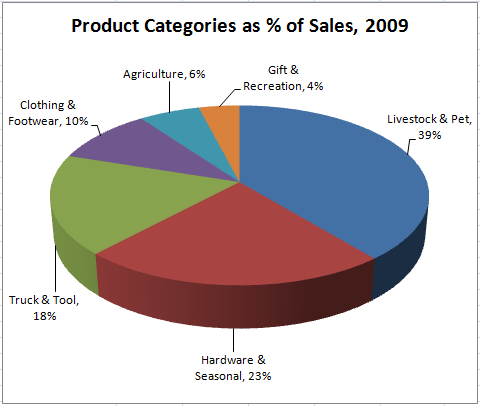 The company reports six product categories which appear in the graph below. The Livestock and Pet category is the largest and has grown from 33 percent of sales in 2007 to 39 percent of sales in 2009. The company has also emphasized private label offerings in the pet food and livestock feed business. The company’s overall business is highly seasonal with the second and fourth quarter representing the stronger periods. To the extent that consumable products gain a larger share of sales, the seasonal variation in results may diminish to some extent. With an average transaction value of only $42 in 2009, a significant number of customers appear to be using Tractor Supply for lower ticket day to day supplies rather than big ticket items. Tractor Supply has been able to fund expansion without resorting to significant financial leverage due to the strong cash flow provided by the business. Management has improved cash flows from operations in recent years, in part driven by better management of working capital. 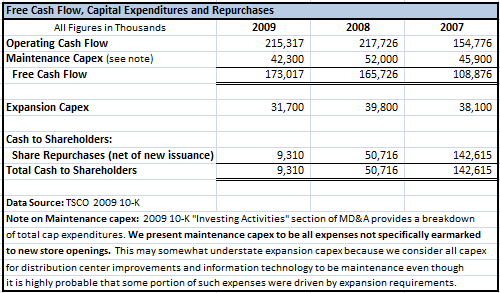 Free cash flow has fully funded expansion capex as well as repurchases over the past three years. The company initiated a small quarterly dividend of 14 cents per share earlier this year. The following exhibit highlights free cash flow and the use of the cash over the past three years. 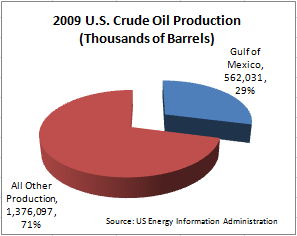 Management projects that total capital expenditures will be between $90 and $100 million for 2010 driven by approximately the same number of store openings in 2009 but supplemented by additional investment in the distribution centers required to support the store expansion. As noted previously, Tractor Supply faces competition from larger companies such as Home Depot and Lowe’s, so how does the company attempt to differentiate itself? It appears that there are a combination of factors at work and the business results over the past few years indicate that the differentiation strategy is working. First, the company operates a smaller store format and is located in areas that are closer to its chosen niche market of recreational farmers and ranchers. By locating in smaller communities and operating a smaller and more targeted retail strategy, the company seems to be competing well against larger and more diversified home improvement retailers. Second, the company states that it seeks to differentiate itself through superior customer service by having employees who understand the rural lifestyle and the products required by customers. Home Depot in particular has suffered a hit to reputation in recent years for cutting experts from its stores in favor of less knowledgeable employees. Facing unique needs, the rural customer base seems to prefer dealing with people who understand their requirements. Third, the company seems to celebrate the “rural lifestyle” and this message may simply resonate with the target market in a way that general advertising of the major retailers does not. Larger retailers like Home Depot or Lowe’s typically focus on the suburban consumer rather than the rural farmer. The advertising message of Tractor Supply is quite different from these larger players. There are a number of potential tailwinds at work that could help Tractor Supply grow profitably over the next decade. While the company targets a niche market, the size of that market could be growing. Over the past decade, many Americans have decided that living in exurban or rural areas is appealing compared to the congestion and perceived risks of living near big cities. The September 11, 2001 terrorist attacks in New York and Washington accelerated this trend and while memories may fade over time, there is still a segment of the population that finds a rural lifestyle increasingly attractive. The desire to live a rural lifestyle is not enough to establish a trend on its own because most people in urban and suburban areas do not work in agriculture and would not be able to replace their incomes by starting a small farm. Tractor Supply’s target market of recreational farmers and ranchers typically have other sources of income outside the agricultural sector. 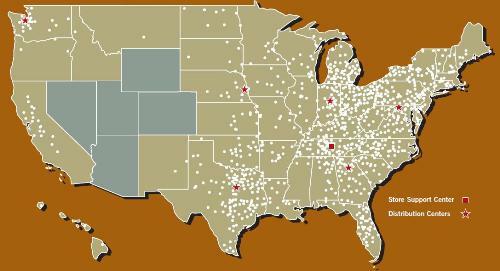 A major enabling factor has been the proliferation of broadband internet access throughout America. While the most rural areas still do not have adequate access, this is rapidly changing. There are many Americans in professions where work can be done in any location that has high speed internet access and is reasonably close to a major airport. Professionals in a variety of fields can work in remote locations and still maintain access to urban areas when the need arises. Such consumers will have a high level of disposable income and live in areas with much lower housing costs. Many Americans have no desire to live on a farm, but those who do may find it increasingly feasible to do so in the coming years. 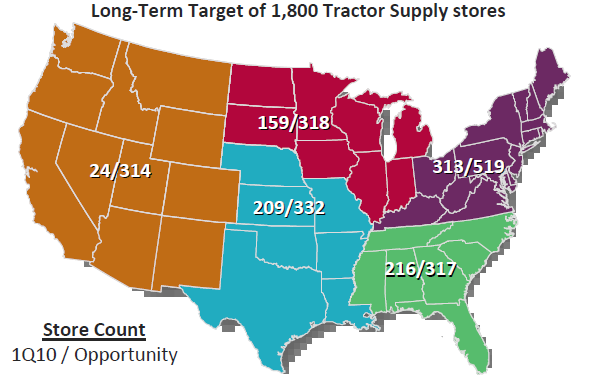 Given that this is exactly the market that Tractor Supply is targeting, the demographics could create a tailwind for the company in terms of expansion opportunities. Tractor Supply is a niche retailer that has posted a strong record in recent years and seems to have ample opportunities for expansion over the next ten years. The company recently announced strong results for the second quarter of 2010 and this has not gone unnoticed by the market with shares approaching record high levels. Based on management’s forecast of 2010 earnings, the shares trade at approximately 16.5 times forward earnings. While not inexpensive compared to the overall market on a P/E basis, the valuation is favorable when compared to Home Depot and Lowe’s given Tractor Supply’s superior growth prospects. Value investors may find the shares to be on the expensive side at the moment but the company is worth keeping on the radar in case negative consumer spending statistics in the coming months cause the entire retail sector to decline. Disclosure: No position in Tractor Supply. Does Instant Information Promote Market Efficiency? the only thing disqualifying this from a superb investment is the fact that it’s not trading at a bargain price….. Agreed, although Mr. Market does crazy things. If there are poor retail sales figures or consumer confidence shows some unexpected blip, the market will rarely differentiate between strong and weak retailers. If we get many hints of a “double dip”, I’m sure that buying opportunities will emerge. In particular, poor news on housing will hammer anything peripherally associated with housing, TSCO included, even though the locations in which TSCO operates are not normally within the bubble zones given their more rural focus.